This week’s Toehold Power of Photography Contest is here! The theme is ‘Monuments’! Share with us some brilliant images you have made depicting the theme! The Contest is open from today, 19 November, until Sunday, 25 November. — Do NOT forget to add the hashtags #ToeholdPower and #Monuments! That’s the only way we can find your entry to this contest. That’s it! The deadline for the contest is 11:59 p.m. IST on 25 November. Winners will be picked and announced by 28 November, Wednesday! The winner of last week’s Power of Photography Contest with the theme ‘Monuments’ is here! This lovely image is made by Sai Pranit. 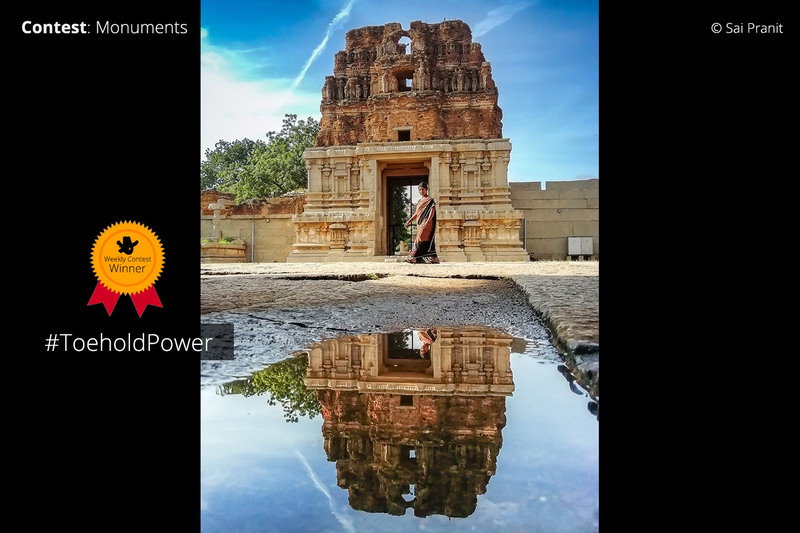 Our Moderators appreciated the creative composition of this image, especially the inclusion of the reflection of the entrance of the Vitthala Temple in the puddle.